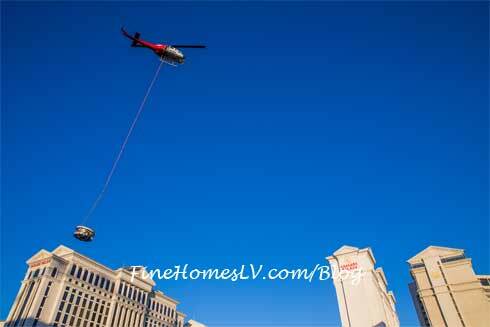 Dramatic entrances are part of Vegas and that’s what happened when an impressive Japanese-inspired onsen tub via helicopter arrived for installation on the sweeping terrace of the lavish 10,300 square feet Nobu Villa. 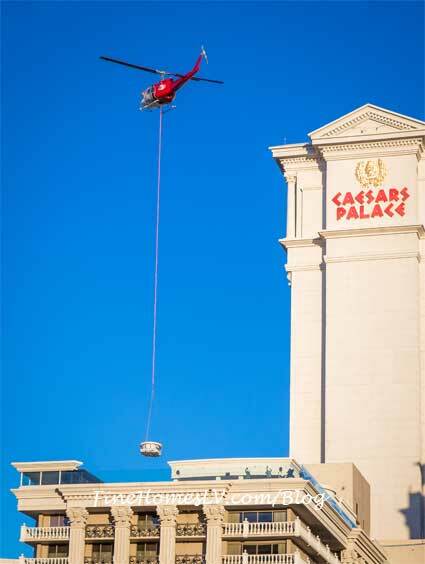 This marked the final piece of the world’s first Nobu Hotel Caesars Palace Las Vegas. The custom-made tub features adjustable hydro massage positions and can be used either as a hot tub or a mini plunge pool for a cool dip. 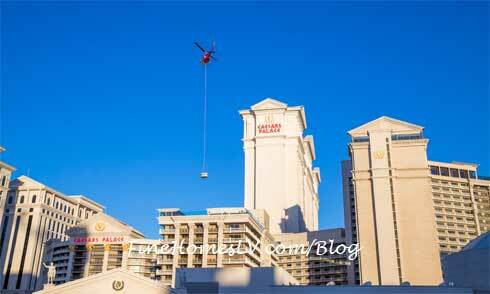 The final element needed for completion of Nobu Hospitality partners Chef Nobu Matsuhisa and actor Robert De Niro’s first-ever Nobu Hotel, the well-travelled tub made its way from Italy and has already traveled by sea and by land to Las Vegas for installation by helicopter airlift on the terrace of the crown-jewel of the property, the Nobu Villa. Designed by Rockwell Group, the three-bedroom Nobu Villa is the epitome of relaxation and luxury. It is an airy, generously proportioned space with soaring ceilings inspired by the traditional art, architecture and design of Japan. In addition to the five-person Zucchetti KOS mini pool, the Nobu Villa’s notable outdoor space is the ultimate sky-top lodging and offers an expansive 4,700 square feet terrace overlooking the center of the Las Vegas Strip with sweeping views, robatayaki grill and Zen garden. The pinnacle of the Nobu Hotel, the Nobu Villa is luxurious and plush yet maintains a relaxed and modern look and feel. Available as part of the new Anthology Suites collection, the multi-functional space can also be used as a venue for special events for 60 to 120 people. Rockwell Group developed a sophisticated language of layered materials and architectural elements, including rich shimmering fabrics, warm wood, bronze finishes, and custom artwork throughout the space that captures and celebrates the Nobu lifestyle. Additional standout features include a signature omakase sushi bar, ultramodern media and game room, gym and massage room, private elevator and art gallery. Recently completed, just in time to celebrate the first anniversary of the Nobu Hotel Caesars Palace in May, a Second Floor Fitness Center and Lounge made its debut. Created at the request of Matsuhisa and Nobu Hospitality primary shareholder De Niro, the Lounge features a business center with complimentary WiFi for Nobu Hotel guests, morning coffee and tea service, registration and concierge services and an eight-seat conference table and Board Room. Additionally, the Fitness Center offers a variety of the latest equipment by Technogym including cardio and strength building equipment and even Matsuhisa’s favorite flexibility-enhancing machine for stretching. In its inaugural year, the world’s first Nobu Hotel, Restaurant and Lounge Caesars Palace has garnered acclaim and honors for its originality, distinctive design and keen attention to service and detail. From being named among the Best New Food Hotels by Condé Nast Traveler as revealed on the Today show, being heralded as the Top Hotel Opening in North America in 2013 by Luxury Travel Advisor, dubbed as one of the Hottest New Hotels of 2013 by CNN Travel, to being included among Luxury’s 25 Most Innovative Brands by Robb Report, the Nobu Hotel Caesars Palace has had an extraordinary debut.